The spring of my freshman year, I asked a close friend to shave off half of my hair. I spent most of the next day looking like a cross between a punk rocker and Two-Face from Christopher Nolan’s “The Dark Knight.” By the end of the day, I had borrowed that same friend’s razor and shaved the other half off. The motivation behind my radical and abrupt hairstyle change stemmed entirely from my involvement with the Rollins Men’s Crew Team. Every year before I was a sophomore, new crewmembers would shave their heads for the first regatta of the season, the Metro Cup. This tradition is well-documented in columns of photographs in the U.T. Bradley Boathouse on Alabama Drive, with rowers sporting haircuts of varying creativity and quality. My personal favorite is the reverse monk, where all the hair is shaved save a small circular patch on the crown of the head. I could write a whole list detailing the ridiculous cuts we wore freshman year, but I bring up our tradition of temporary baldness for another reason: to put to bed the hazing stigma and clear up the confusion about what hazing really is. Hazing, originally known in Germany as “pennalism” and in England as “fagging” (two terms with similarly dehumanizing connotations), has been around since Greek life originally began. It was common enough in ancient Greece that Plato complained about “practical jokes … that injured the hazed and citizens who got in the way” (Nuwer, 1999, p.92). In medieval academia, pupils and professors alike employed hazing to ensure new students and faculty knew their place—namely, beneath theirs. This behavior was normalized because, in spite of people’s criticism, everyone understood what hazing was meant to engender in the victim: respect. A pragmatist would look at hazing and recognize it as the most immediate and effective means of establishing a pecking order where seniors lead and newbies follow, no questions asked. New members learn to pay heed to and follow behind the members and traditions that came before. If its continued use by Greek life, college sports teams, and military branches is any indication, it evidently works. What separates hazing in the first two from hazing in the military is the fact that, in the latter, obedience can be literally a matter of life or death. 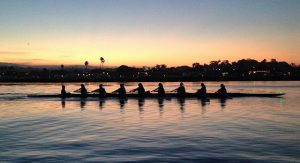 On crew, rowers learn and earn respect from veteran crewmembers by following their leads in workouts, taking advice from them on the water, and receiving encouragement as they pull their 2Ks. The respect they build for the older rowers comes before they choose (no one is forced) to shave their heads in the spring; shaving is a display of dedication inspired by the commitment rookies observe among the experienced. I love rowing and I love my crew; no force was required. I earned it and they earned it from me from months of training together and working under the same colors toward a common goal. The experienced members of any organization should appreciate the opportunity to foster respect and loyalty among its membership over time. Maybe outside college athletics, unquestionable loyalty is essential, but for the four years people are in it, the rule of thumb stands: unnecessary haste makes waste.